Is this the original vuvuzela? Johannesburg, South Africa (CNN) -- Love them or hate them, vuvuzelas are hard to ignore -- the plastic trumpets have become the accessory of choice for soccer fans at the 2010 World Cup in South Africa. The horn's power to pack an ear-splitting rasp, and the ease in which it can be customized by its owners, means the instruments have been snapped up by football supporters from Port Elizabeth to Polokwane. But despite the controversial coronet's recent popularity, the history of the bugle's origins is a matter of passionate debate, not to mention potential lawsuits, in the "Rainbow Nation." 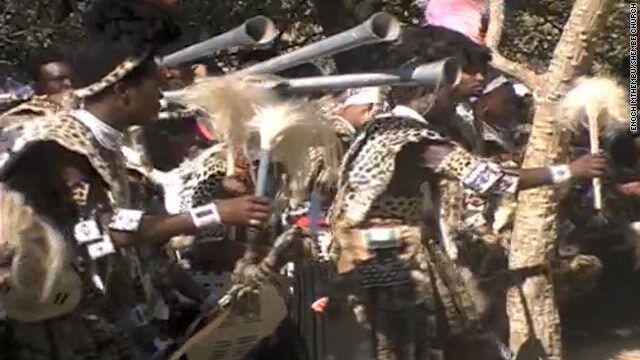 According to Enoch Mthembu, the public relations officer for the KwaZulu-Natal-based Shembe Church, the vuvuzela is an instrument that originated with his brethren at the dawn of the 20th century and should be recognized formally as such. Video: Vuvuzelas all the buzz? Or buzz kill? "We can make miracles happen when we use the vuvuzelas to heal sick people. We don't use it like the soccer fans, we use it more constructively," Mthembu told CNN. Shock, horror - vuvuzelas go global! "Today they are making millions from this and they are not even acknowledging where they got the instrument from." Mthembu's ire is aimed at manufacturers such as Masincedane Sport, a company co-owned by Neil van Schalkwyk, which trademarked the name and has been selling the instruments since 1999. Shembe, also known as the Nazareth Baptist Church, said it has taken out a lawsuit against Masincedane Sport, requesting that its heritage be recognized, though Van Schalkwyk denies any knowledge of this. "It is not about the money, but the principle," Mthembu said. For members of the Shembe Church, the history of the cherished instrument is integral to their faith. Mthembu confirmed that the vuvuzela was not a descendant of the more traditional Kudu horn -- an instrument created from the horn of a Kudu antelope, which Zulu tribes used to communicate. "It was introduced in 1910 by prophet Isiah Shembe, who is the founder of our church, to play alongside African drums when we dance and worship God," Mthembu said of his church's vuvuzela. "Originally, the vuvuzelas we used were made out of cane wood, but later we used metal instead." Plastic vuvuzelas hit the market in the late 1990s when Van Schalkwyk, who was a semi-professional footballer and part-time plastic molder, got the idea from fans of Kaizer Chiefs and Orlando Pirates, who brought their metal vuvuzelas to games in Cape Town. However, their presence at football matches in South Africa dates back to the late 1980s according to Philani Mabaso, the communication officer for Durban-based Premier Soccer League side AmaZulu FC, formerly known as Zulu Royals. Mabaso told CNN that his club may have been the first to have a vuvuzela on its terrace. "The first match I saw one there was in 1987 when AmaZulu played Jomo Cosmos, there was a man with a big, metal vuvuzela," he said. "Most of our supporters are members of the Shembe church, which is very prominent in our province. They would come from their congregation straight to the match. I think we were one of the first, if not the first, because of this." Mabaso said the fans' vuvuzelas gave his team an edge over their opponents. "They add a lot of atmosphere into the game. You have a very good sound coming when they are all blown at the same time," he said. "Some fans make tunes, very nice tunes. It gave us an advantage, it changed the whole mood and vibe of the stadium." The popularity of the instrument at the World Cup seems to testify to Mabaso's opinion. "When we started we were selling around 1,000 a month if we were lucky, we're now selling around 50,000 a month. We've also sold the licence to a company in Germany too," Van Schalkwyk told CNN. A number of manufacturers of the instrument claim legitimacy for the product, though Van Schalkwyk says he is happy to acknowledge the Shembe's claim as originators of a similar instrument. "They have definitely played a huge role in horn blowing. I recognize their contribution to the culture, though I thought their horn was called an "imeomvu," but I'm happy to be corrected on that." Despite the commercialization of the product, Mthembu is pleased so many people have adopted the instrument. "We're not against soccer fans using it, but we want people who are selling it to acknowledge that it came from our church. "A lot of our members used to manufacture them, and their income has disappeared. We don't want a share in the profits -- but as custodians and creators of this thing we have not benefited."